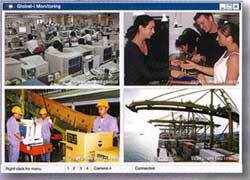 Securitex Electronic Systems Engineering/ Remote tele-surveillance system. With the Remote Tele-Eye now you do not need to travel to your remote site to see what is happening there, You can watch the activities from the comfort of your office and home. Your remote sites can be accessed easily using a PC or notebook via a telephone line. LOCALLY OR ABROAD, ANYTIME AND ANYWHERE. With the Remote Tele-Eye you do not need a computer on the remote site thus save you cost and maintenance. The above system allowed up to 4 cameras connection thus allow all angle of your remote site to be capture. Up to 16 cameras may be connected to one telephone line on site (Using daisy chain method). Ability to copy still images and record continuous video. 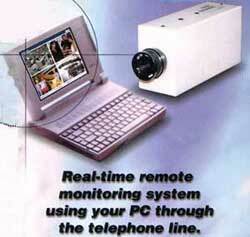 Real time remote display surveillance. Up to 4 cameras display simultaneously. Built-in intruder detector. Can be configured to page 2 different persons upon detection. 45 frames of continuous video are then captured of the scene, which can be downloaded to a PC. Able to connect to an external motion detector. Image resolution 320 X 240 pixels colour. Can be used in indoor and outdoor lighting environment. 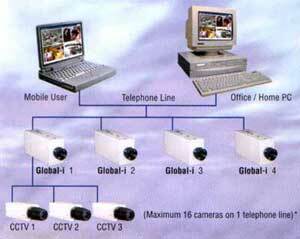 Complements existing CCTV system and convert them to remote surveillance capability instantly. Remote Tele-Eye can connect maximum 16 cameras to 1 telephone line. For the above configuration you do not need any computer on your remote site. 1 unit 5VDC power supply and the power cable. 1 unit additional 3 camera connecting cable. or contact Securitex Electronic Systems Engineering at +65 67852171 our sales personnel will get back to you.